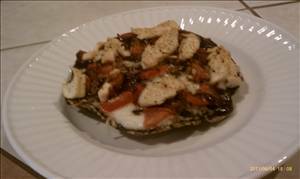 A low carb barbecue chicken & bacon "pizza" on a portobello mushroom. Scrape gill from portobello mushroom cap. Spray pizza pan and bottom of mushroom with olive oil “Pam” like spray. Sprinkle cheddar cheese inside mushroom. Add diced chicken and torn basil leaves. Drizzle with a low carb barbecue sauce. Top with sliced tomato, crumbled bacon, and seasoning of choice (like Concord Foods - Bacon & Chive Roasted Potato Seasoning mix). Broil for about 8 minutes. Drizzle with ranch dressing and serve! Chicken stuffed with avocado and salsa and wrapped in bacon. There are 378 calories in 1 serving of Barbecue Chicken & Bacon Portobello Pizza. Calorie break-down: 65% fat, 10% carbs, 25% protein.